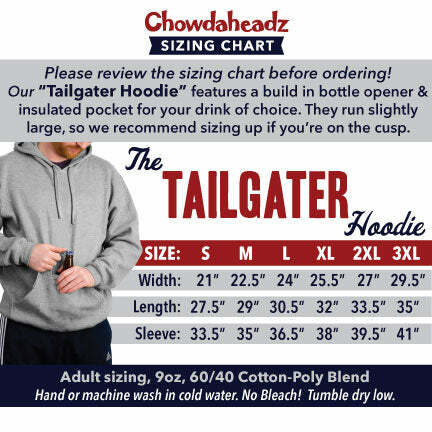 Fenway Sign Tailgater Hoodie, Includes Bottle Holder Built Right Into The Pouch! The most useful hoodie you will own! This super-soft pullover hoodie features a built-in koozie drink holder, as well as it's very own attached bottle opener. Keep your beer cold but your hands warm at any tailgate or game. The koozie pocket also closes with velcro so it's another great option for safe storage of your phone, keys or wallet. Perfect for any tailgate or outdoor party! At Chowdaheadz, we love helping people represent the Boston area and the teams, places, and cultural nuances that make Boston unique. OurUSA Printed New England Tailgater Hoodies will keep you warm on a chilly day and help you show your pride for the best baseball team and park wherever youtravel. Enjoy the high fives that come as you encounter those with the same interest. New England baseball fans everywhere love paying homage to their pride and joy by wearing this hooded sweatshirt. These hoodies are made with high-quality materials to ensure a comfortable, breathable, and flattering fit. Our hoodies are made of a 60/40 cotton-poly blend. Our shirts come in many sizes and will fit as expected. We offer sizes S through 3XL. These aren’t just ordinary hoodies. They have a pouch on the front that has a velcro opening where you can store beer bottles and other beverages. The hoodie also comes with an attached bottle opener. Whether you enjoy living in Boston or just want to represent your happy place, you’re sure to stand out in a crowd or at a sporting event with this high-quality hoodie. And the best part is that this hoodie was decorated and printed in the USA by hardworking people. These hoodies also make great gifts for friends, family, co-workers, and others who love baseball. Chowdaheadz is a company that is owned and operated by passionate New England fans and residents and has 15 years of experience bringing you top-notch New Englandapparel. We love our region and strive to help others sport their pride as well. Sport your New England pride with Chowdaheadzclothes and other fan apparel.